This Cowl was knitted with yarn sent to me in a swap on the Kniting Paradise forum and I loved the colour and the way it knits up. So a big thank you to Lynda from Watford for sending me this lovely yarn. Repeat these two rows until you have almost used up the yarn leaving enough to Bind off and sew with. 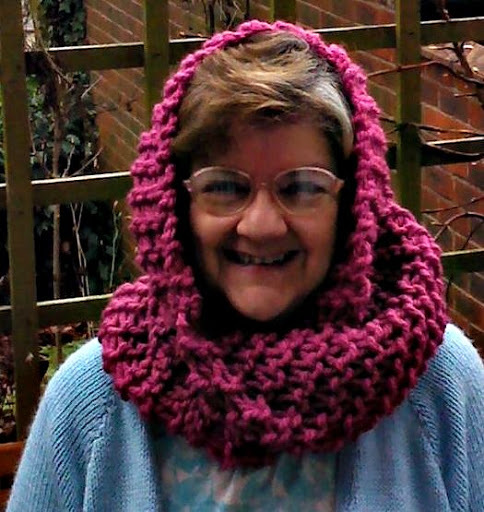 It was easy to make and can be used around the neck or as I am wearing it over the head as well. I seem to recall casting on 56 stitches and you do twist it before seaming. The cowl was sent to a charity so I do not have it now.